To this day I'm scared stiff of heights, I don't like being too near to the edges of cliffs or the such like, anywhere where there is a sheer drop that I can see. Iv'e never gone up in the London eye for this very reason. Last edited by Sharone Stainforth on Tue Sep 07, 2010 12:34 am, edited 1 time in total. The other time was when I found myself on a day time shift, something I was not used to. I had to go to LRHs cabin and help him get ready for the day.He already had someone in attendance, Ken Urqhart, who was a sort of butler/valet. It was his job or hat to show me what I had to do. LRH had already had a wash of sorts at the small sink and was now sitting in a chair, where I was expected to wash his feet. I was uncomfortable about it as I had never done anything like this before. It was Ken who told me not to worry, I would get used to it.After washing and drying LRHs feet, who was sitting in the chair with just a pair of underpants on, I then had to dress him in a certain order. On this particular day he had a meeting of some sort and was wearing his full naval dress uniform. Ken showed and helped me to dress LRH on that day. "The man who wanted to rule the world" certainly enjoyed being waited on hand and foot, literally. I find it pretty disgusting. In March of 69 Scientology and Hubbards flotilla were ordered out of Corfu by the Greek government. Sharone, thank you for continuing to fill in the details of your story. The fact that you recall these events so vividly is indicative of the strong emotions you felt as a young girl separated from her father, and the emotional impact definitely comes through to the reader. I'm sorry, I'm a total failure when it comes to the internet and anything electronic. Will persevere though. I got something in the mail a couple of days ago, not from scientology so don't worry about it, but it was a big shock to the system.It has put an image in my head that is horrifying.It kept me up all night. J. Swift would have a field day with that one. To the friend that sent the mail,give me a few days, I always looked up to you, you know that dont you? Hey Sharone, I really appreciate all your stories. It is helpful to me to know that other people are dealing with some of the same crap I am (or worse). Especially because, like you, I sometimes have wondered if I'm just being paranoid and imagining things. So, thank you. It is hard when you go through stuff like this.You find yourself doubting yourself, even though you can see it with your own eyes.When everyone around you gives explanations for why you must be imagining things, it just makes the matter worse, because you start to think what they are thinking, that you must be crazy. Never in my life have I suffered such weird stuff going on in my life as that which is connected to Scientology. It is the stuff of science fiction books, only it is for real, that is the horror. There is so much more, I haven't said, I could probably go on into eternity.That is for another time. The biggest thing with regards scientology is the hypocrasy, it will be its downfall, of that I am certain. Best wishes to you DoubleVee, here's a bit of advice I would do well to heed myself. 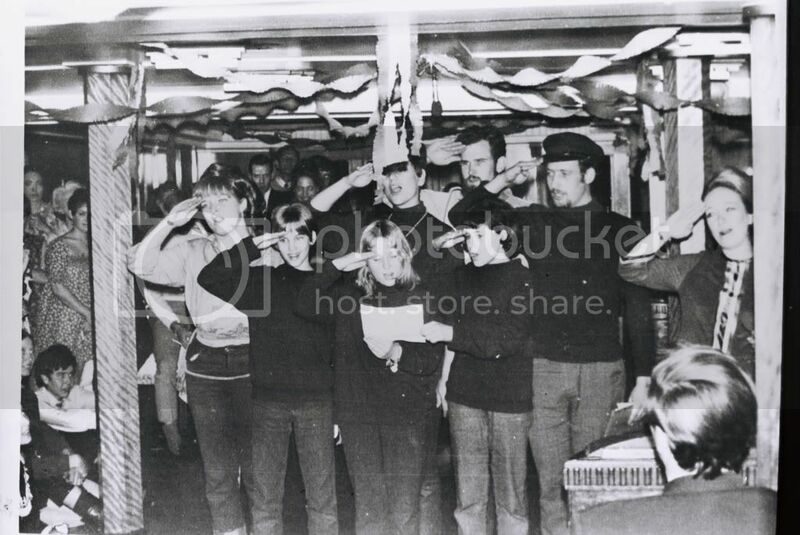 This photo was taken on board the Apollo 1968/1969 New Year. Thats me in the middle at the front. I was shocked when I first saw this photo. It is one thing to remember things from the past, another all together to see yourself in black and white. This reminds me of the Hitler youth and that is what is so shocking about this photo, at least for me. I am not joking here, this is absolutelytrue. It is with great amusement I realise I have gone through the wall of fire and achieved OT111. I'm not sure whether to be elated or not . All I really want is an SP declare. Maybe you have one and don't know it. Apparently I wasn't told for quite a while.